From the minds of the director of the original “Evil Dead,” Sam Raimi, and the remake director, Fede Alvarez, it is no surprise that “Don’t Breathe” is a riveting and thrilling cinematic piece that will keep you guessing until the very end. With a running time of 88 minutes, “Don’t Breathe” seems to be following in the footsteps of the big horror movie of the summer, “Lights Out,” with a short and simple but well-executed plot. Jane Levy, another “Evil Dead” alumni, makes her return to the screen in another compelling performance. Her character, Rocky, is introduced as a tough girl with an absent father, alcoholic mother and innocent little sister. Rocky desperately wants to get her and her sister out of their toxic, moneyless home but does not have the resources to do so. Rocky’s sympathy-inducing situation makes her the obvious protagonist of the film and makes it a little easier to overlook the fact that she is so willing to break into a blind man’s home and steal from him. Daniel Zovatto plays Rocky’s boyfriend, Money, and Zovatto successfully portrays the cliche scummy boyfriend: the obvious candidate for the first death. The burglary gang would not be complete without Alex (Dylan Minnette). Minette’s boyish good looks and nice guy persona never fail to lighten to movie’s dark premise. Alex’s involvement in the group is never fully explained since it doesn’t seem like he really needs the money or enjoys breaking and entering, so it left to the assumption that he is only doing it for Rocky, adding to his likability. The movie was filmed in Detroit, especially in the older, run down innermost parts of the city. The dark and desolate nature of the town seems befitting for the characters, who all have dark parts of themselves. In many wide shots of the film, behind the beautiful homes and apartments, abandoned warehouses and empty lots loiter the background. This was an interesting way to draw parallelism to the outer appearance of the characters versus their inner immoral behavior. The most blatant foreshadowing in the movie is when the teens are scoping out the house of the lonely, war veteran (Stephen Lang). Alex discovers he’s blind and says, “Isn’t it kind of messed up to rob a blind guy?” To this, Money replies, “Just because he’s blind doesn’t mean he’s a saint,” obviously hinting that it is going to be a much more difficult night than expected. At first it does seem kind of messed up to rob a blind guy, and his self-defense and Money’s not so sad casualty seem very justifiable. But that is just the tip of the iceberg. The nameless man has many secrets of his own, and these all unravel whilst Rocky and Alex are trying to hide. The movie did have a unique game of cat and mouse since in most cases, the most important aspect of hiding is to be out of sight. But in this case, remaining perfectly still and quiet while completely exposed is necessary to survive. This seemingly impossible task adds to the suspense of the film. 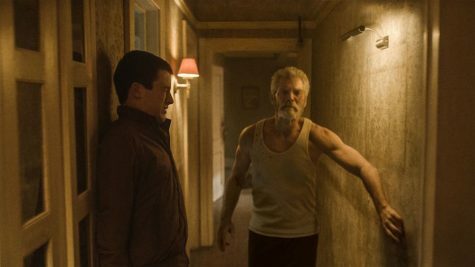 “Don’t Breathe” creates a suspenseful atmosphere through the use of slow motion in several violent scenes, which in my opinion, is very jarring and an interesting way to add to the anxious mood of the movie. The film does include a few plot holes and unrealistic aspects, but aside from those minor errors, “Don’t Breathe” earns it’s 87 percent rating on Rotten Tomatoes and will definitely leave you thinking about the lengths you would go to for the people you love.